rows to form a circle around the thumb. When I first knitted the Circle Mitts, I thought that it might be a good idea to knit something similar but at right angles to them – while the Circle Mitts are knitted around the circumference, the mitts described here are knitted along the radius. 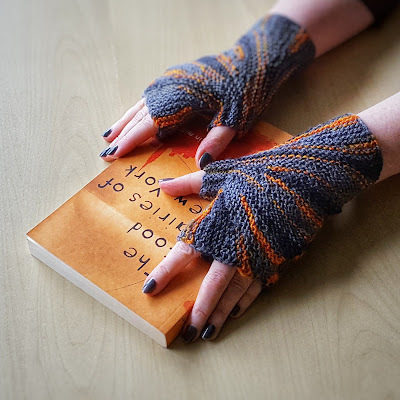 A crochet version of these mitts is available here: Sparkler Mitts. 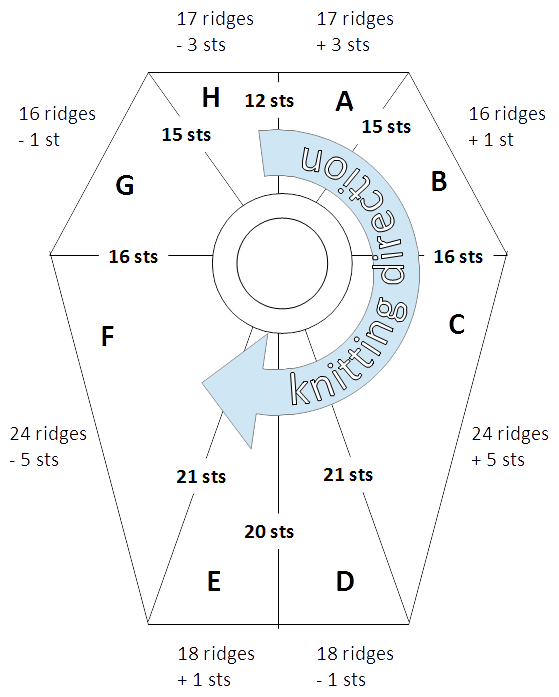 Short Rows: Short rows are one of my favorite knitting techniques because they not only allow you to shape your knitting but also to created interesting graphical pattern. There are several techniques for short rows – and it’s a matter of taste which one you prefer. I’ve recently learned a technique called German short rows: when you turn, bring yarn to the front and pull it back so that a sort of double-stitch is created, then knit back as usual - when you have to knit the double-stitch, be careful to knit it as one stitch (see also https://www.youtube.com/watch?v=P6n561SMZXQ); this method has the advantage the no picking up of stitches is necessary. In the pattern, this stitch will be called t+p (turn and pull). Provisional Cast-On: This method of cast-on usually uses some waste yarn that can be remove later to get live stitches, these stitches can either be used to continue knitting in the opposite direction or to graft these stitches to the rest of your piece. My favourite method is the one using a crochet hook (http://www.youtube.com/watch?v=UeExgbgTOgs). 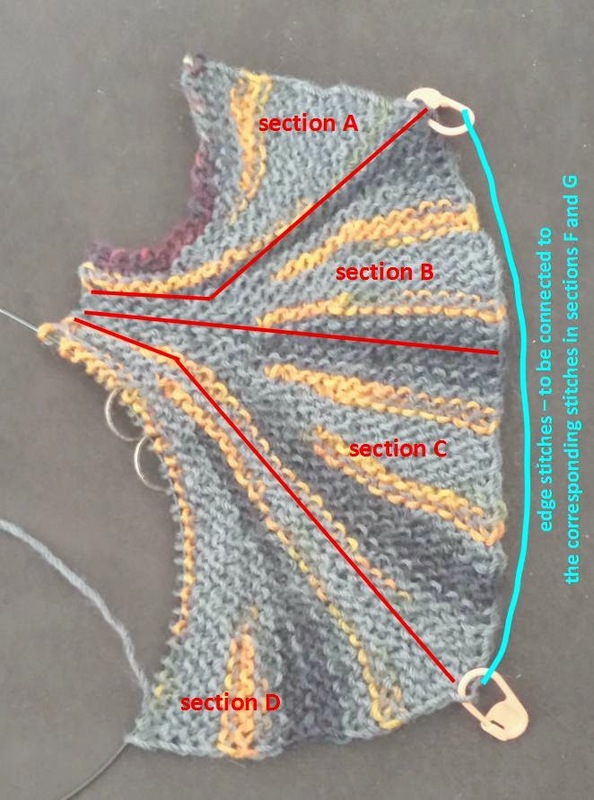 The first time you use your working yarn, will be called row 0 in this pattern. There are other methods as well. E.g. the one explained in knitty (http://www.knitty.com/ISSUEfall05/FEATfall05TT.html). If you use this method, you don’t need to knit the row number 0, because you already have your first row of stitches in working yarn. Grafting: Grafting (also called kitchener stitch) is a great way to finish garments without a visible seam (If you want to know more about grafting – it’s different stitches and mechanics – you should read the “5 Grafting Myths”-series by Joni Coniglio on knittingdaily.com). To finish these mitts you need to be able to graft both in stockinette and in garter stitch. Alternatively, you can just knit the last stitch of each row in section F and G and sew the two sides together afterwards. 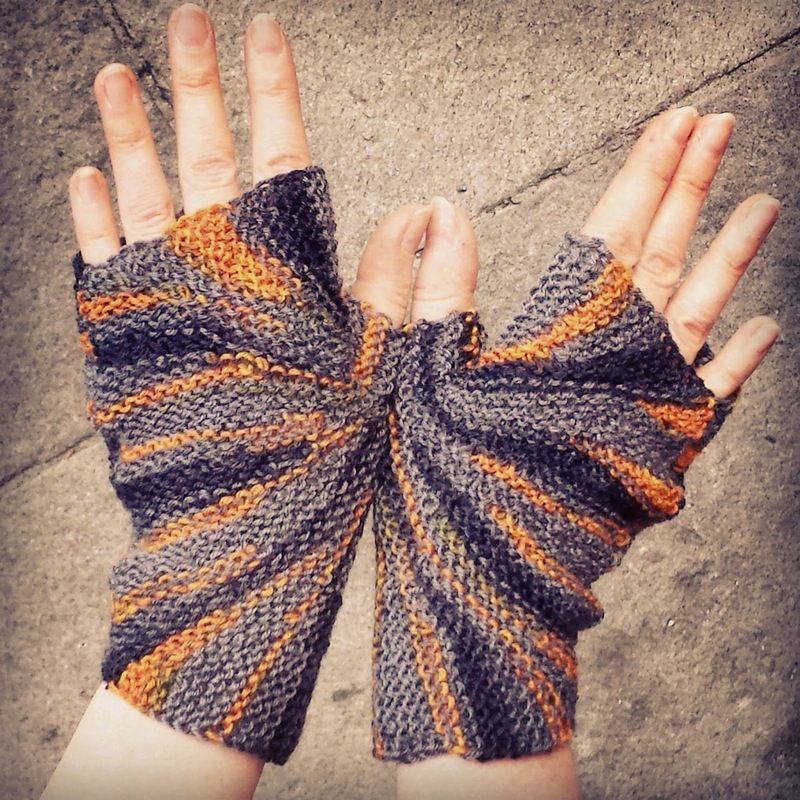 The mitts are knitted flat in eight sections (from A to H). 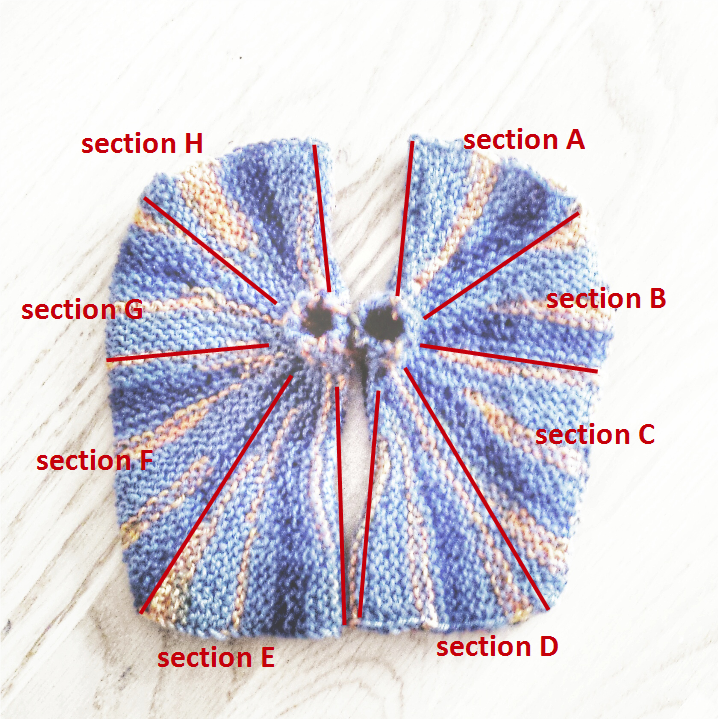 The diagram shows how shows how the sections form the complete mitt, how many stitches there are in between the edge and M1, as well as how the stitch count changes. It also shows the mitt is to be folded and which parts are to be attached to which when finishing the mitts (or while you're knitting section F and G). Sections E, F, G, and H are mirror images of sections D, C, B, and A respectively, i.e. where there is an increase in A, there is an decrease in H - and the short row lenghts are mirrored as well. 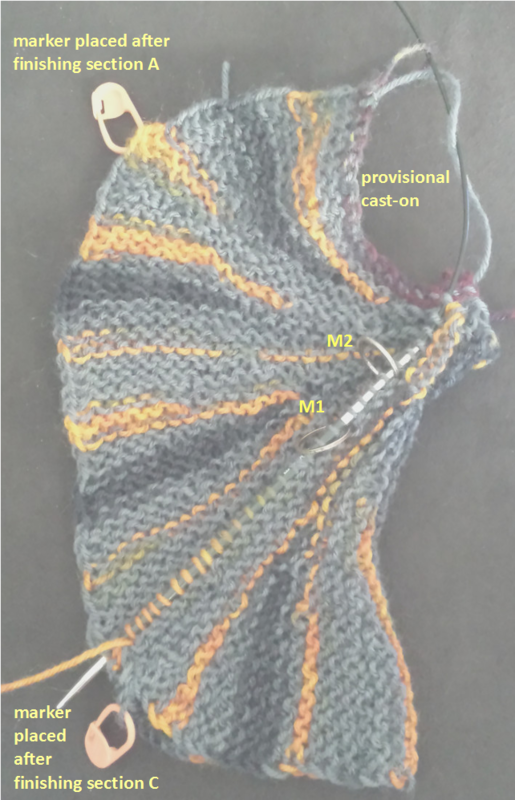 The photo shows how the mitt should look after finishing section D.
During section F, you will attach the last stitch of each ridge with an edge stitch of section C (and during section G with and edge stitch of section B). For this you need to fold the mitt along the folding line and attach the sides as you go along - as explained above in "Techniques". The picture on the right shows how the mitt looks after you have knitted a few rows of section F when you connect the halves as you go. Alternatively, you can just knit the last stitch of each row of section F and G; and sew the two edges together afterwards. Ridge 95: sl1, k3, t+p, k to last stitch, ssk+c (with edge stitch of ridge 56, i.e. one below stitch marker C) - the abbreviation ssk+c is explained above in "Techniques"
Cut yarn but leave a tail of about 50 cm. 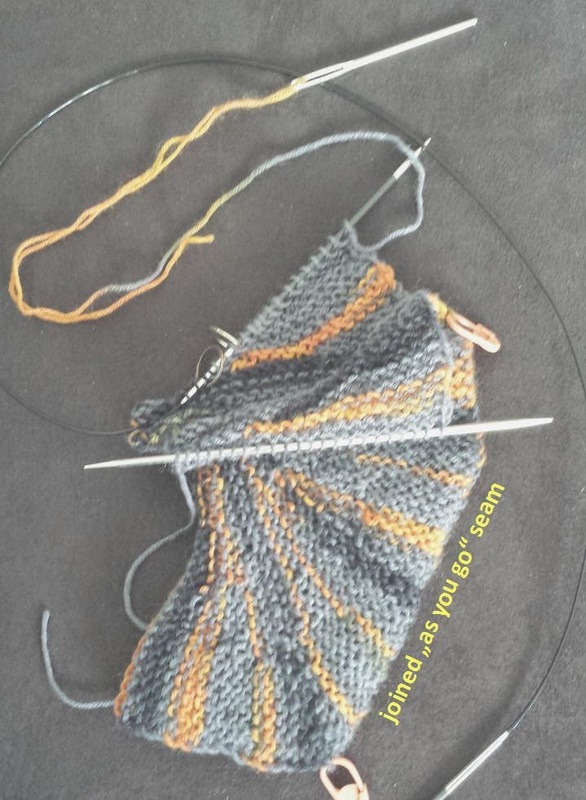 Take out your scrap yarn of the provisional cast on and put the live stitches on a knitting needle. Graft in garter stitch till M2, then finish grafting in stockinette stitch. Make sure to treat the double-stitch as one stitch. If you haven't connected the edges during sections F and G, sew sides together. This pattern is listed at favecrafts.com. These are really pretty! I love the colorway you've chosen for both pair! Thank you. The yarn is called Froehlich Wolle Special Blauband - unfortunately, I lost the label so I don't know the colourway. What is t+p? That is the only part that has me confused. Thanks for the awesome pattern though. It looks like fun to knit! If you happen to know a standard abbreviation for this, please let me know. I love these, I am learning to knit so I can make cool things like this! I haven't knitted in years, and it's projects like this that make me want to pick it up again. Absolutely beautiful! Thank you! I really like your seashell washcloths! I am so glad you came back to party with us this week! 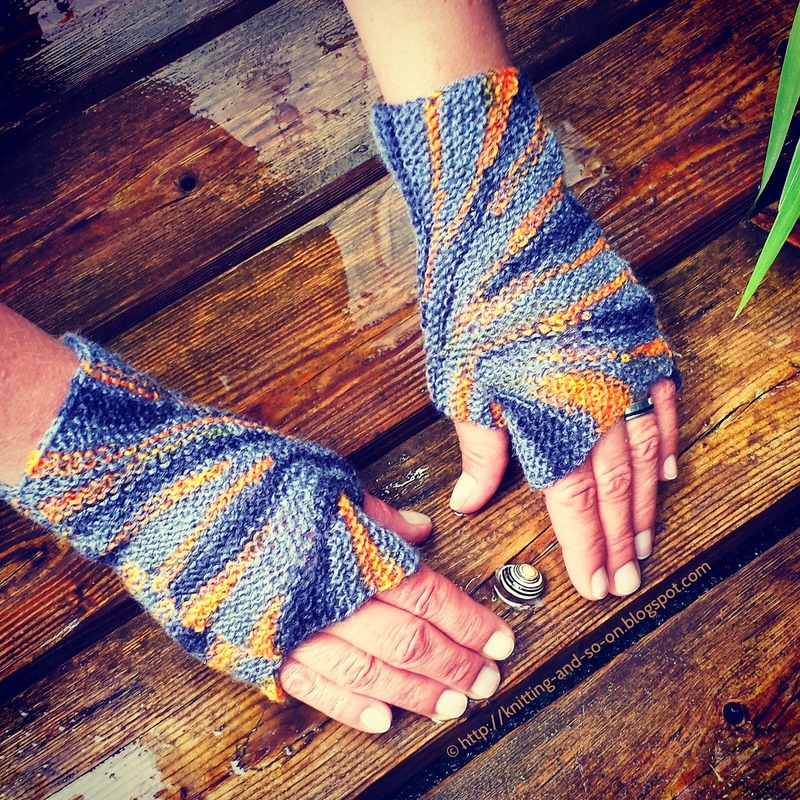 I have chosen these mitts as one of my Yarn Favorites, and featured in this week's party. 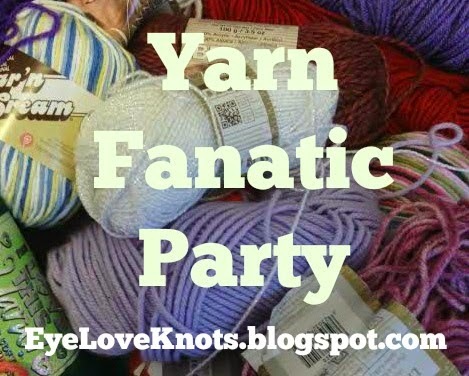 #27 is live - http://eyeloveknots.blogspot.com/2015/03/yarn-fanatic-linky-party-27.html. I will also be sharing with my EyeLoveKnots Facebook fans Wednesday afternoon, and pinning to my Hobby: When I Learn to Knit board. Thanks so much for sharing, and I hope you will come back to party with us again real soon! First of all, I love this pattern and am making it right now which is why I have a question. Since you said the sections mirrored one another shouldn't ridge 136 be: sl1, k6, t+p, k to last 3 stitches, ssk, k. I was just wondering because otherwise there would be two pulled stitches right on top of each other. you're absolutely right. I have corrected it. Love these, I've just knit a pair for my Mum for Christmas. I managed to knit them seamlessly. I did a provisional CO and knit segments H then A, then I picked up the stitches at the CO and knit the first wedge of B on one side and then the other and so on for segments B and C, essentially knitting F and G backwards at the same time. Then left one side and knitted segments D and E and did a three needle cast off.